Aikido master Shingo Nakao, 7th dan, conducted a seminar over the weekend for the local aikido community. Nakao Shihan was accompanied by his wife, Akiko, and two senior students. This seminar was a project of Kiryukan Dojo. 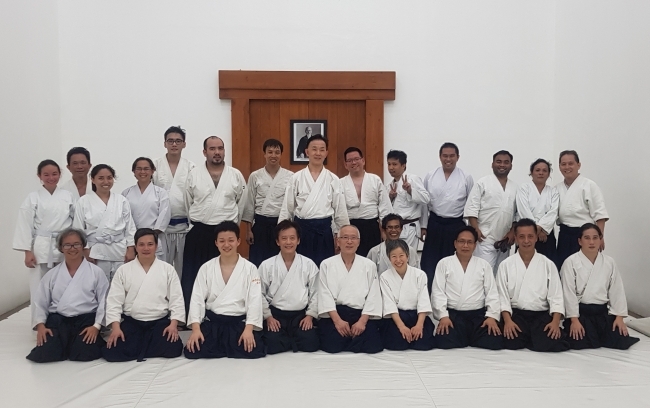 Nakao Shihan gave his first class at the Makati Aikido Club dojo at Makati Sports on Friday, February 9th, and four subsequent classes spread out over Saturday and Sunday at the International School Manila in Taguig. The photo below was taken after the Friday class at MAC.